Queenstown will always be one of my favorite places on earth. Home to never ending mountain views, pristine lakes, a small town feel and more restaurants and shops than imaginable. 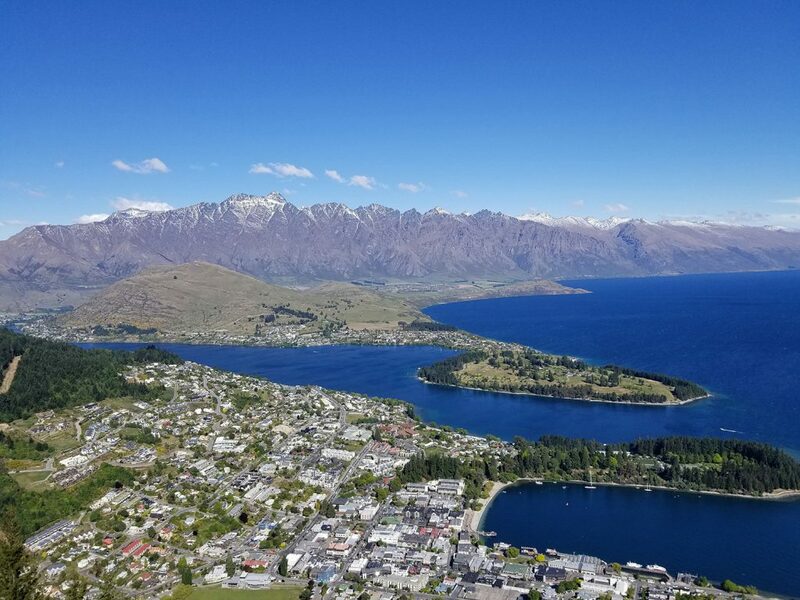 Queenstown on the South Island of New Zealand will always be a place I long to call home. 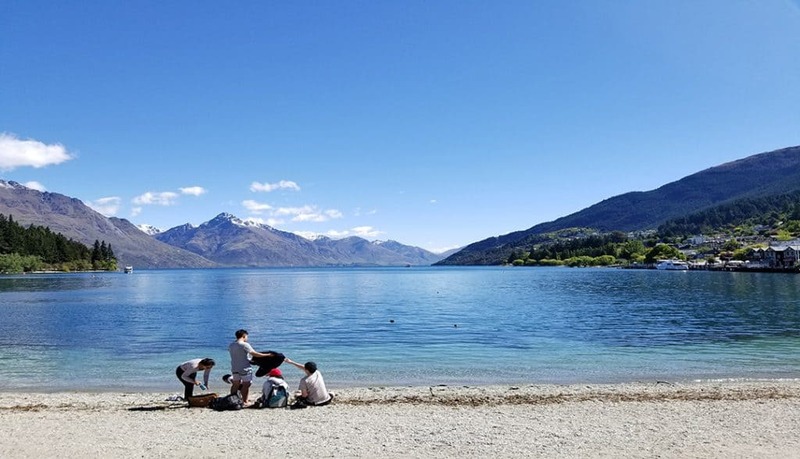 Whether it’s jumping off a mountain or out of a plane, hitting the trails on a day hike or skiing trip, tasting wines, jetboating, or simply relaxing; Queenstown truly has something for everyone. A must-do for those with prior dirt bike or ATV experience, Nomad Safari’s Quad Safari was an outing that I’d absolutely do again. Per the norm with activities in New Zealand, first came the safety briefing and gear fitting. 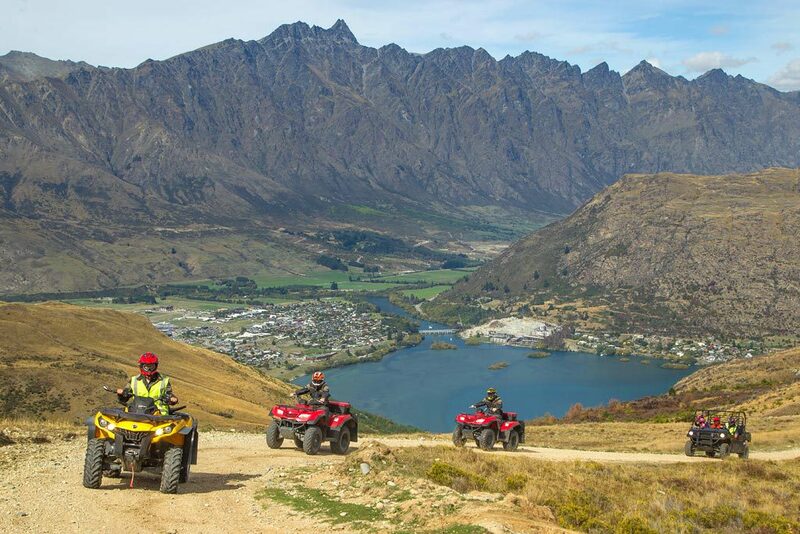 We were advised that quad biking is the most dangerous activity you can do in Queenstown. 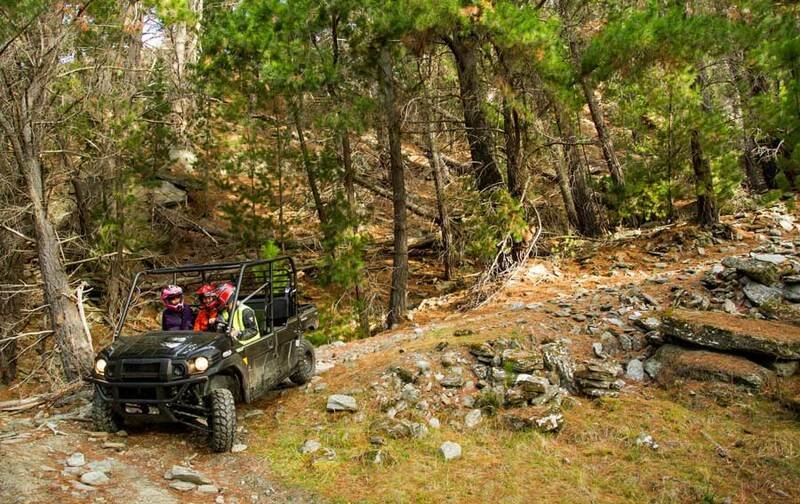 After a brief tutorial on how to operate the ATV’s, we drove out to the test track to polish up on our skills. Here, they determine if anyone is unfit to journey on their own ATV – and if so they will simply ride on the back of one of the guides bikes. After a few rounds on the test course, we were off and ascending Queenstown Hill. Delighted to find fresh snow, we quickly made our way through powder and mud puddles. We stopped at every gorgeous outlook imaginable. We enjoyed hot chocolate and biscuits over the most beautiful snow-capped mountains. Riding through hills, we made our way through more puddles of mud and slush. All too quickly it was time to head home. I had never been white water rafting, but it was high on my list. 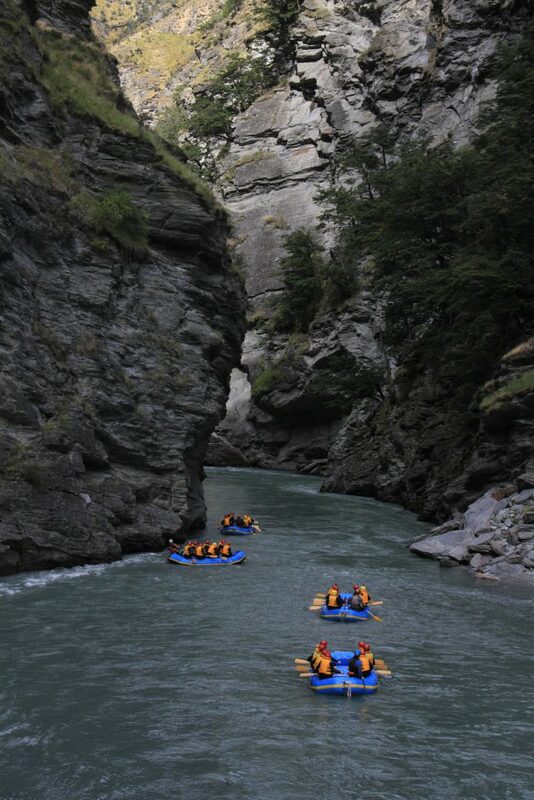 We went for the ambitious Shotover River, graded 3-5, and had a blast. After safety briefing and wet suit fittings, and the treacherous journey on the road through skippers canyon, we arrived at the launch site. They broke us up into groups of 5-8, and paired us up with our guide. Then, we got right in the rafts and advised of the basic rafting commands. After practicing the slew of commands and ensuring we were ready, we paddled off and braced for the rapids. The river had five or six main rapid sections, broken up by calm stretches of the river. We were even given the ability to hop in and go for a swim. I didn’t have to be asked twice to jump in the Shotover River! Although it was freezing, it was sparkling clean – and when was I going to get this chance again?! After getting back in the raft, we headed for the highlight of the river; the cave. 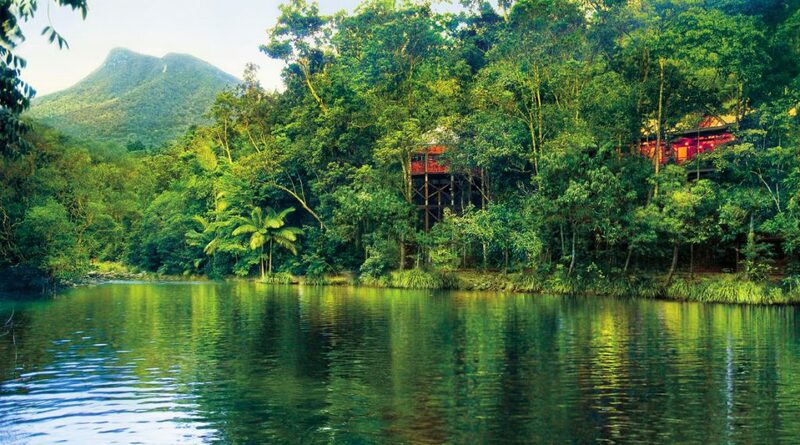 This is one of only two rivers in the world that has a cave you raft through. At the end of the cave was the biggest rapid of the river, and after ducking down and surviving, our incredible journey had come to a close. Out of all of the experiences on my trip, this is the one I would do again in a heartbeat. 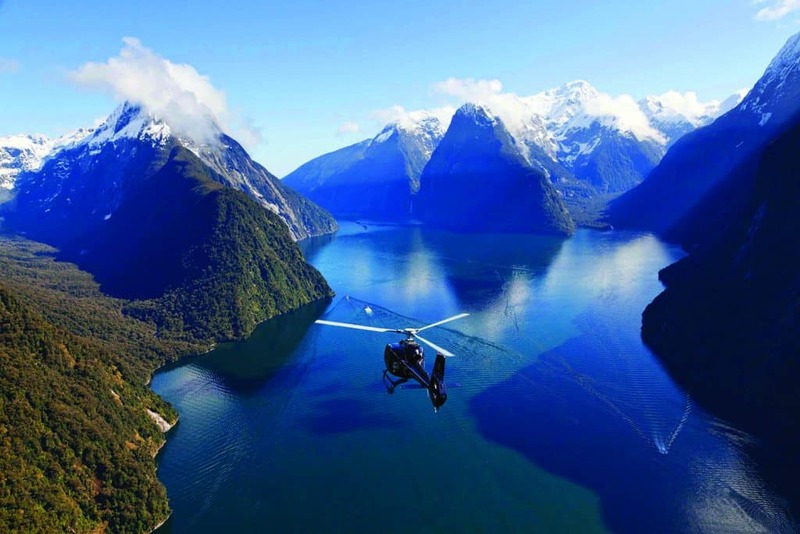 Milford Sound is one of those iconic “must-do’s” for every visitor to Queenstown. In my opinion, there’s no better way to see it than hopping in a helicopter and flying there. By road, the trip to Milford is around 4.5 hours one way. By helicopter, it’s about 30 minutes. We flew over the mountains and into the fjord, and were surrounded by unmatched beauty. On the flight back, we landed on top of a glacier where they stopped the engine of the helicopter so that we could simply enjoy the serene setting and breathe in the fresh air. After snapping some photographs and relishing in the moment, it was back in the chopper and back down to Queenstown. If you’re looking for an adrenaline rush, look no further than AJ Hackett’s experiences in Queenstown. They have a handful of bungies and swings to choose from, and we chose the biggest swing of all: the Nevis Swing. After traveling out to the site, we waited our turn and contemplated our lives – our choices, our regrets – okay but seriously watching the people go in front of you is terrifying! Once harnessed into the swing, we were slowly brought out over thin air and stared down at the canyon below – an over 500 foot drop. It began with a misleading countdown of “5….4…..3….2…” before we were dropped and free falling for a few seconds, before swinging toward the other side of the canyon. The total arc of the swing is just shy of 1,000 feet. After swinging back and forth a few times, and wiping the tears from our eyes, we were able to spot a few goats at the bottom of the canyon while we were pulled back up to safety. 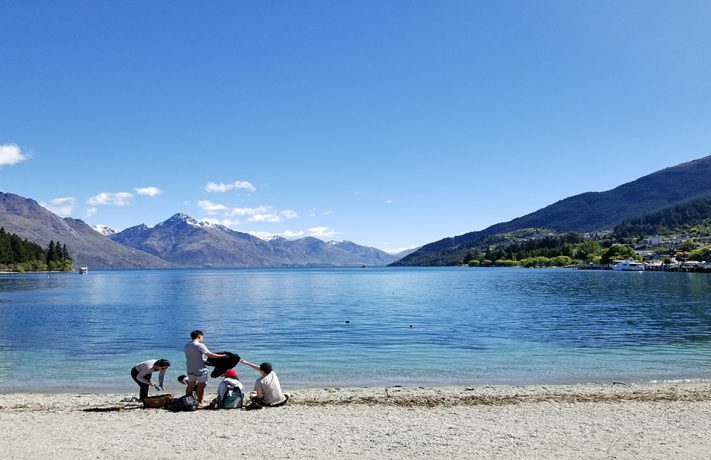 Returning to Queenstown brought a rush of adrenaline and tons of adventure activities, something that Queenstown specializes in! As a graduate of Eastern University with a degree in Anthropology, I have always valued the experiences one can find in other cultures. 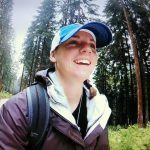 I’ve spent time in Belize, Honduras, Mexico, Kenya, and backpacked across Western Europe seeing 12 countries there. 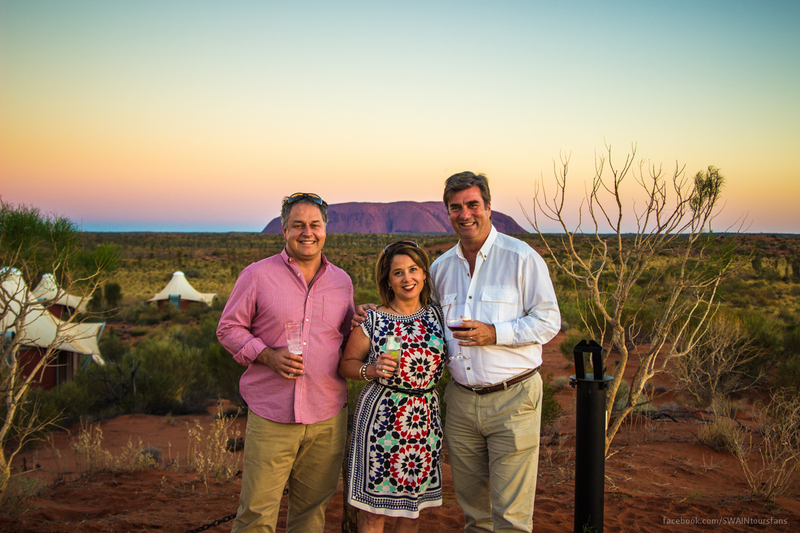 I have lived in Sydney and used it as a base for travels across the country. 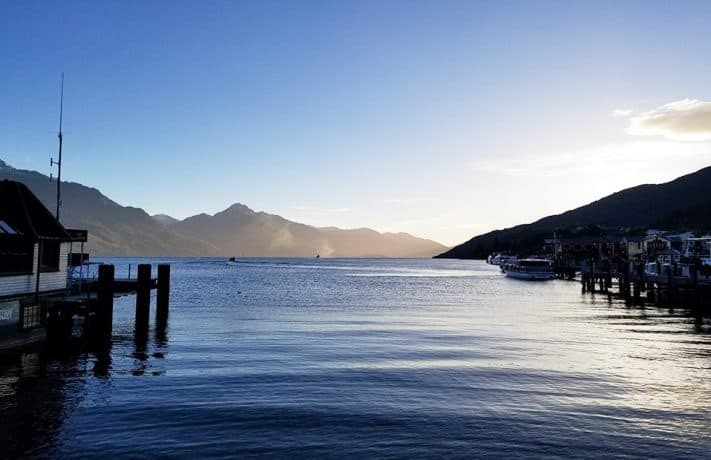 I’ve also spent time in New Zealand; and my latest trip back was a luxury lodge tour across both islands, seeing first hand some of the most breathtaking accommodations and properties that New Zealand has to offer. With the passion and longing for every individual to experience at least one other culture in their lifetime, I have found myself at Swain; with the opportunity to bring this passion to life. 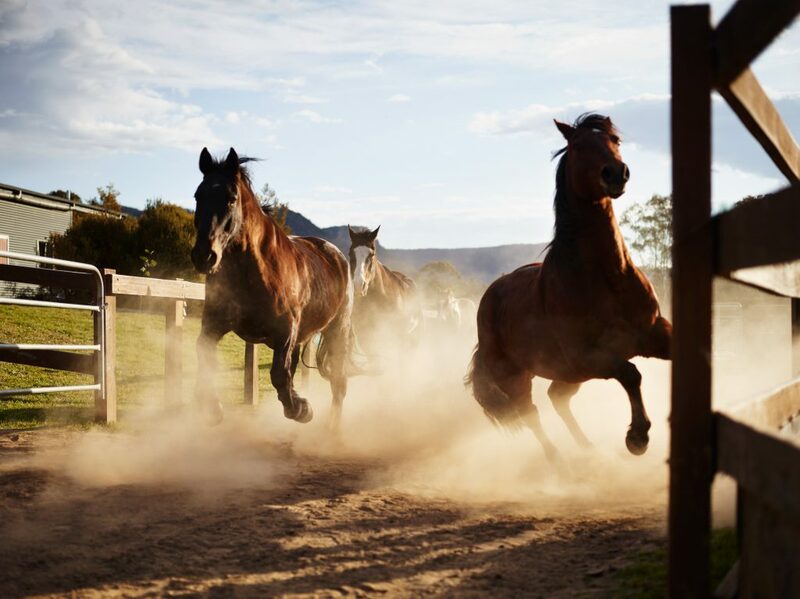 While Christchurch on New Zealand’s South Island may be best known for the devastating earthquakes it has suffered in recent years, this city is certainly worth the visit – especially for its breathtaking surrounds. 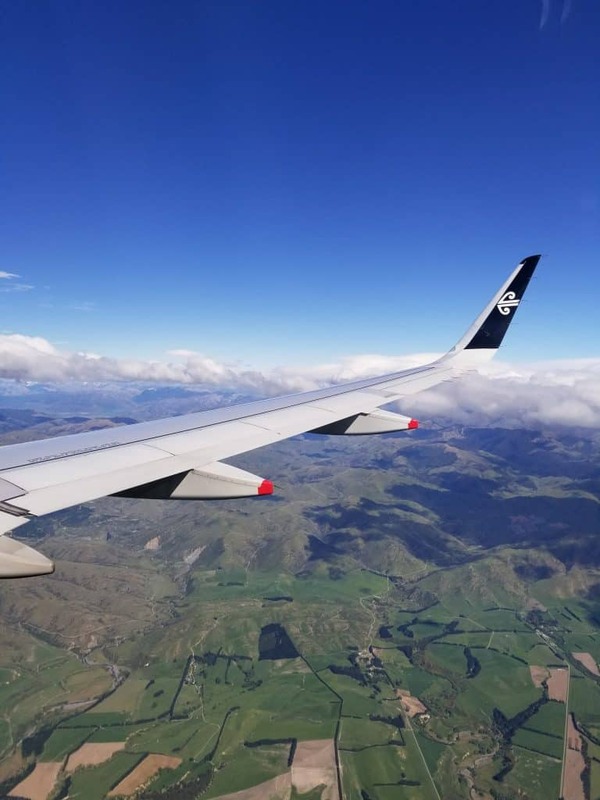 After spending an afternoon exploring the downtown, we had one day to try and see just what Canterbury was all about before hopping on the TranzAlpine to the West Coast. The day began with a brief drive through downtown Christchurch, before ascending the hills on the way to Akaroa. Stops were made to view the incredible scenery. We also stopped for tea down by the water before heading into town. Once in Akaroa, we meandered through some local shops before heading to Black Cat Cruises for our adventure. After receiving a safety briefing and getting fitted for wet suits, it was time to hit the water. 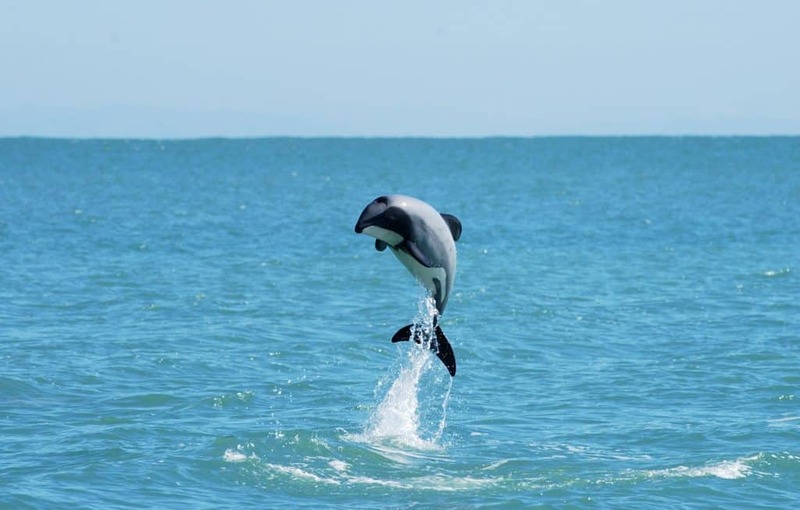 A short 20-minute cruise to the edge of the harbour was all it took to spot the first Hectors Dolphins. We were advised to never reach out and try to touch one of the dolphins. We were to respect their rights as wild animals. After assessing the wild dolphins, the brave jumped right into the freezing ocean for a closer view. After treading water and seeing dolphins in the distance, it was time to move locations for a better view. For the next hour or so we were hopping in and out of the boat, cruising through the harbour and swimming alongside of the dolphins. It was an incredible experience, and one that I’ll never forget. Once back on dry land, it was time for a hot shower and some fish and chips for lunch before heading back to Christchurch. 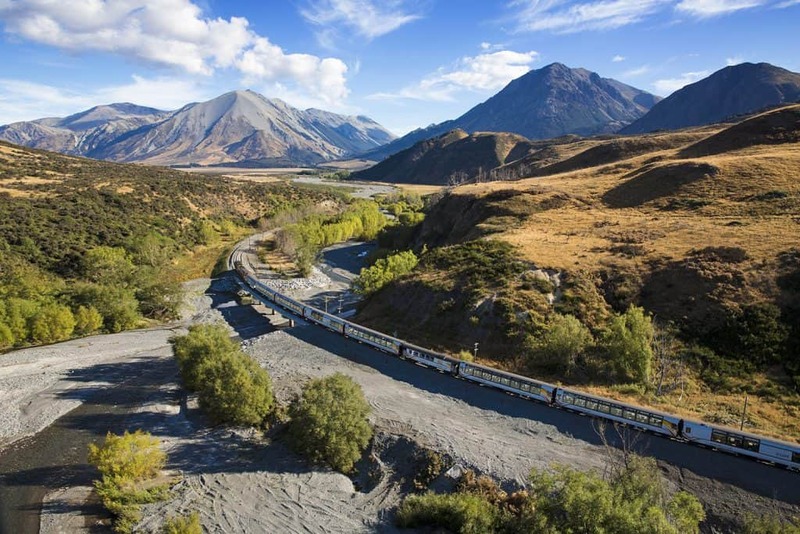 The TranzAlpine Train is the preferred method of travel from the East to the West side of the South Island. This five-hour train ride seemed more like five minutes. You pass through breathtaking scenery of rolling hills and planes, gorges, and snow-capped mountains. We were just a few weeks early for wild flower season, but the colors of the countryside did not disappoint. Each traveler on the train has assigned seats, and there is a full café on-board. The highlight of the train is the open viewing carriage. 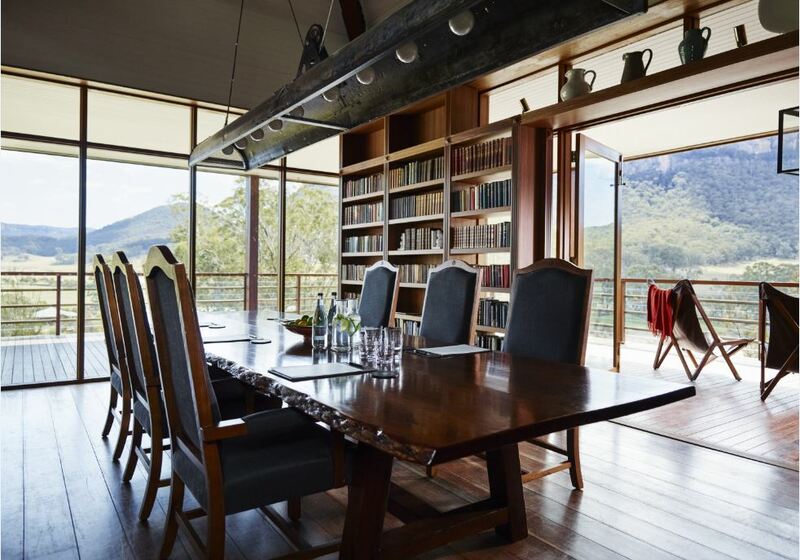 There are no seats, and the windows are wide open with no glass to obstruct the view. After taking the TranzAlpine and driving a few hours down the coast, Franz Josef is the perfect place to spend a few nights. Its remote location is emphasized by a few restaurants and handful of shops, but the beauty of the West Coast is stunning. The biggest feature of Franz Josef is its proximity to the glaciers, most notably Franz Josef Glacier. We lucked out with the weather, and were able to take the only trip they were running the entire week. After safety briefings and handing out gear, the excitement begins with a five-minute helicopter flight from town to the glacier. 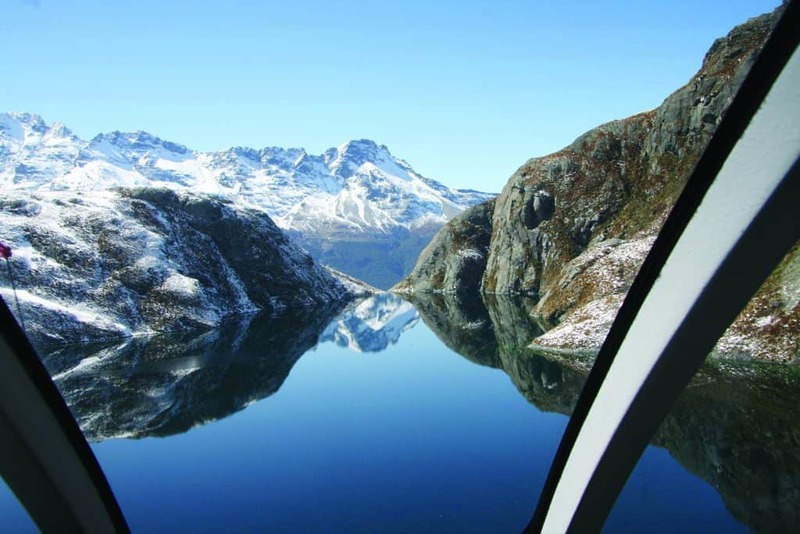 Due to recession, the only access to the glacier is by helicopter – and you don’t hear anyone complaining about that! After getting a bird’s eye view, we touched down on the glacier and were instructed on how to properly put on our crampons. Then we were off! We weaved our way in and out of ice tunnels and across the face of a gigantic slab of ice. After what seemed like no time at all, it was time to head back to the helicopter and back to reality. I think most of us would have camped up there if given the chance! 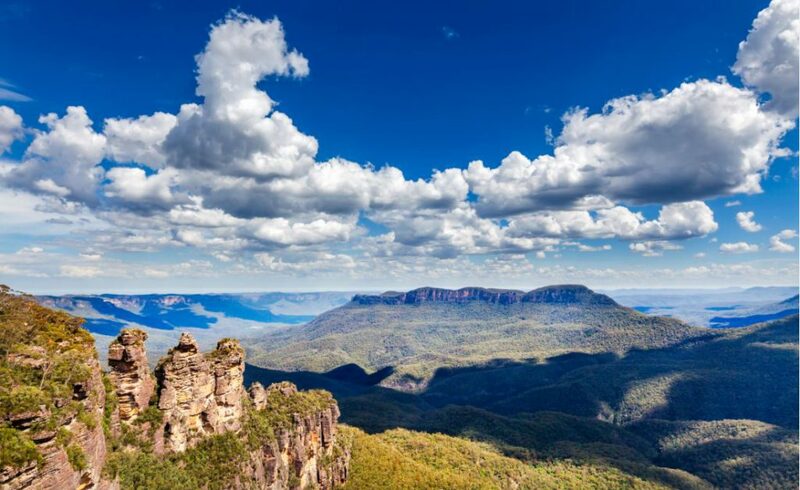 Located in New South Wales, home to the World Heritage-listed Blue Mountains, sits Emirates One&Only Wolgan Valley. 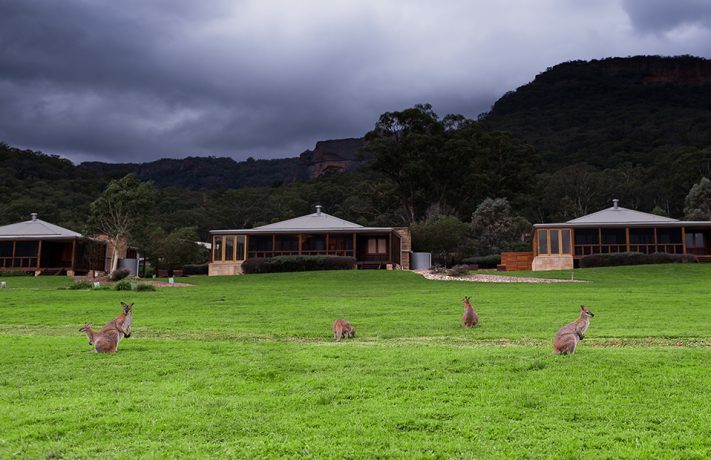 This lodge offers the rare opportunity to experience true luxury in a spectacular Australian bush setting. 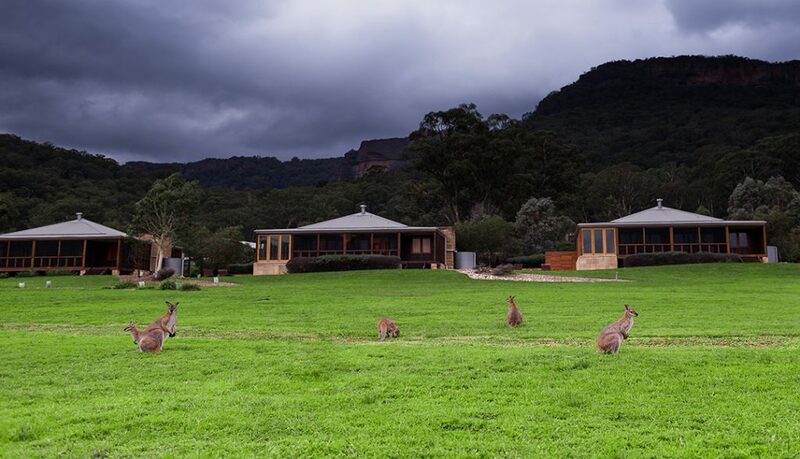 Surrounding by a beautiful backdrop, Wolgan Valley is the true epitome of luxury. 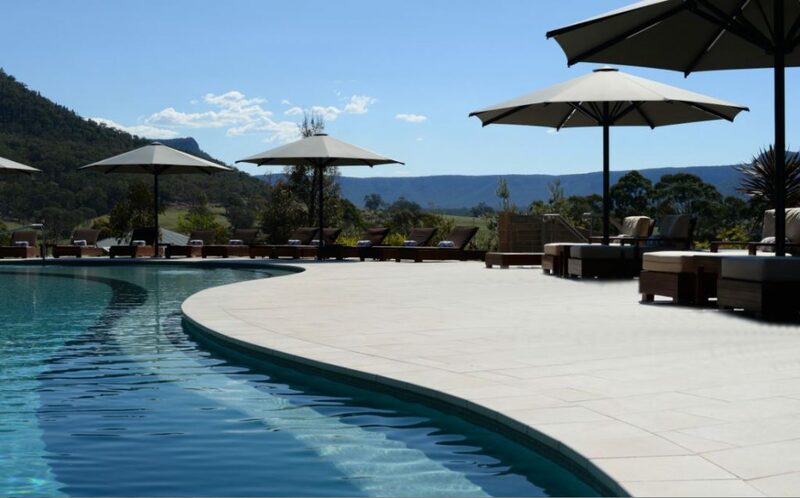 About a 3 hour drive Northwest of Sydney, you’ll find the stunning luxury lodge of Wolgan Valley. The drive is easy highway driving at first, before weaving into the mountains and past Katoomba. The last part of the drive can be intimidating, as you’re winding on narrow roads down into the Valley. We drove there in the dark, which I wouldn’t recommend for the faint of heart! Once we arrived, my partner and I were collected at the car park and taken in one of the lodges 4WD vehicles up to the main lodge of the property. Due to our late arrival, we immediately sat for dinner and were not disappointed to say the least. The cuisine was absolutely world-class. They have a tasting menu if your table is keen to commit, or an a-la-carte menu. The first night we stuck to a-la-carte and then the second evening, went for the tasting menu. Each dish was exceptionally plated and delicious. After dinner, we were taken to our private villa. Our villa had an open concept sitting room and bedroom, divided by a double sided fireplace; large bathroom, walk-in closet, and our own private heated plunge pool. 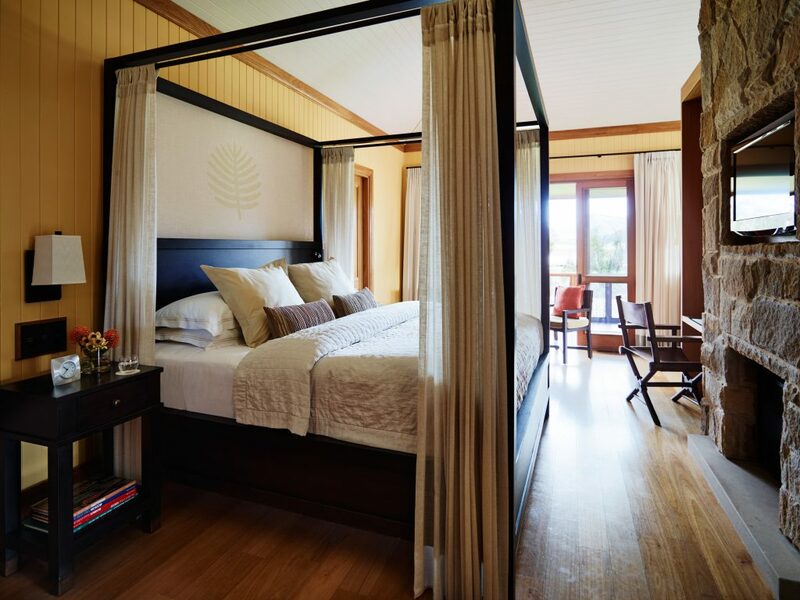 The feel was luxurious, but comfortable; we could have stayed there forever! In the morning, we awoke to a gorgeous view that had evaded us the previous day due to arriving after dark. We were surrounded by stunning cliffs in the middle of a valley. 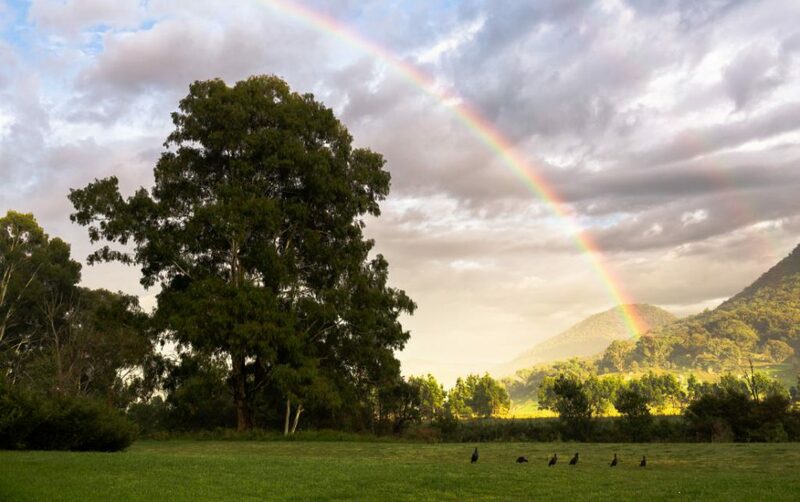 Outside of our villa was a beautiful rainbow, and a few kangaroos. Breakfast boasted an array of buffet options such as granola, fruit, cereals, pastries, juices and breads. There was a hot menu for order as well. Then, we headed off to horseback ride on the property. A staff member drove us to the stables, discussed the basics of riding for those who were new to horseback riding, and paired us with a horse. We embarked on a 90 minute trail ride through the property, and it was breathtaking. Along the way, we spotted kangaroos, wallabies, and lots of bird life. After our ride, we decided to tackle one of the properties numerous hiking and biking trails, spotting more wildlife along the way. After another exceptional dinner, we spent the evening relaxing and looking at the unhindered stars. 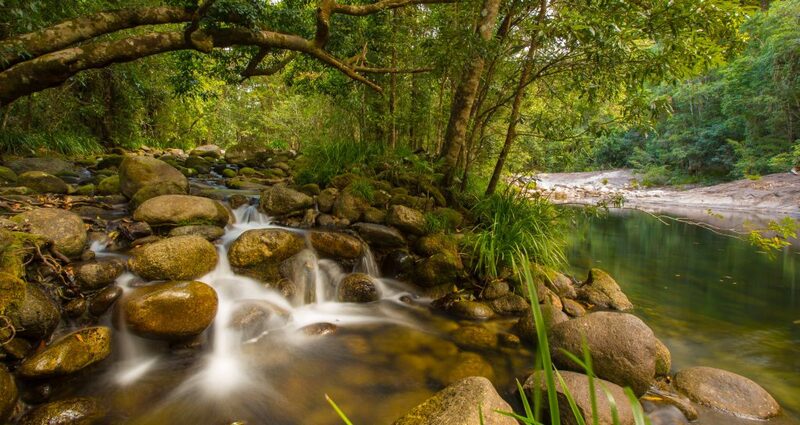 Queensland, also known as Australia’s “sunshine state,” is home to a 110-million-year-old rainforest—Daintree National Park. 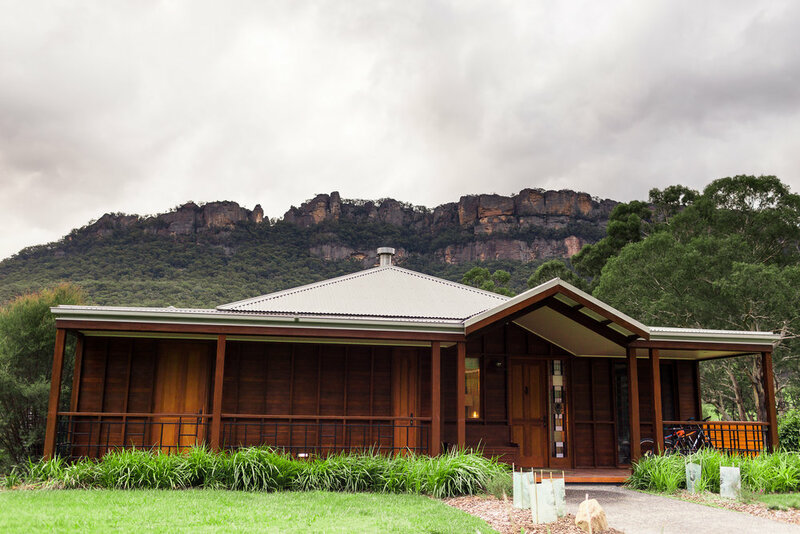 The park is a World Heritage-listed site and nestled on the edge is Silky Oaks Lodge. 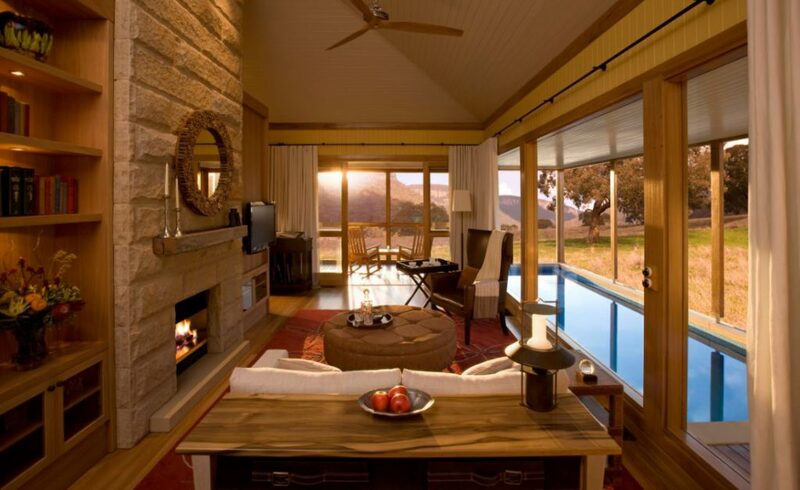 This lodge blends casual and contemporary design, amongst the most tranquil surrounds. 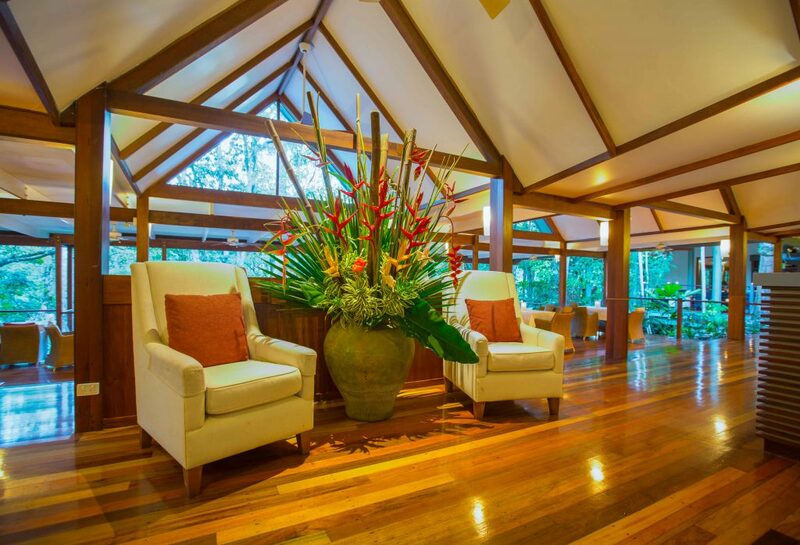 Located 90 minutes north of Cairns and just 20 minutes from Port Douglas, Silky Oaks Lodge is in the heart of the Daintree Rainforest. 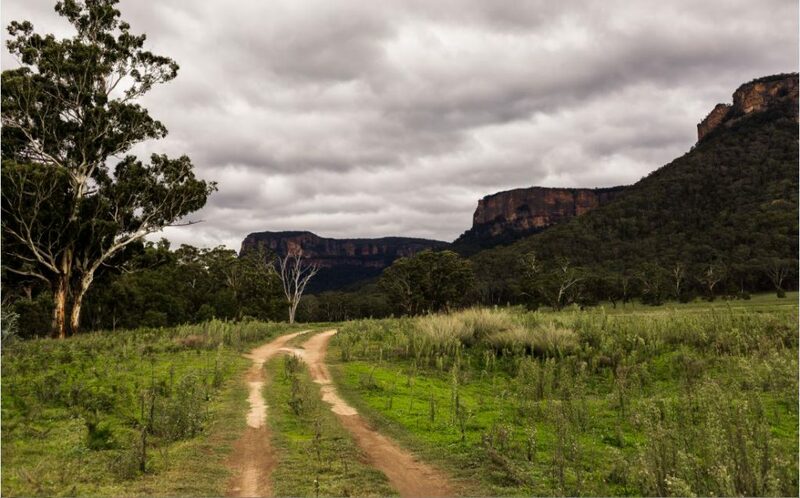 The drive is easy and beautiful, as Captain Cook highway leads the way up the coast. 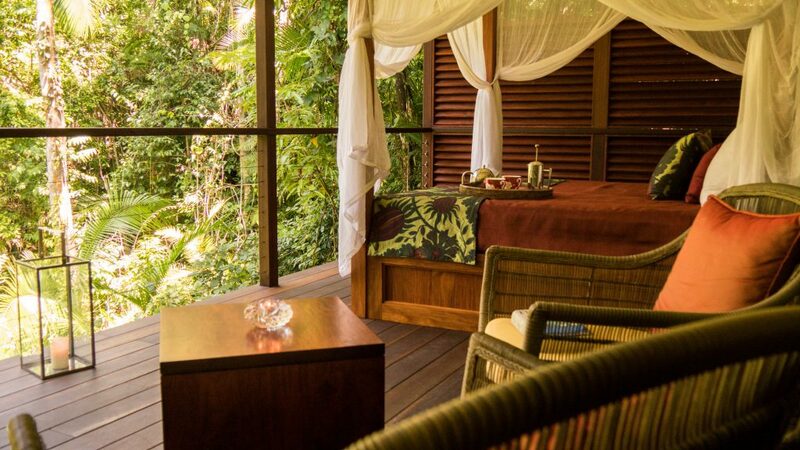 Set on the Mossman River, this lodge provides an immersive rainforest experience while still pampering you with the finest luxury amenities. Upon arrival, my partner and I were greeted with welcome cocktails at a table for two. 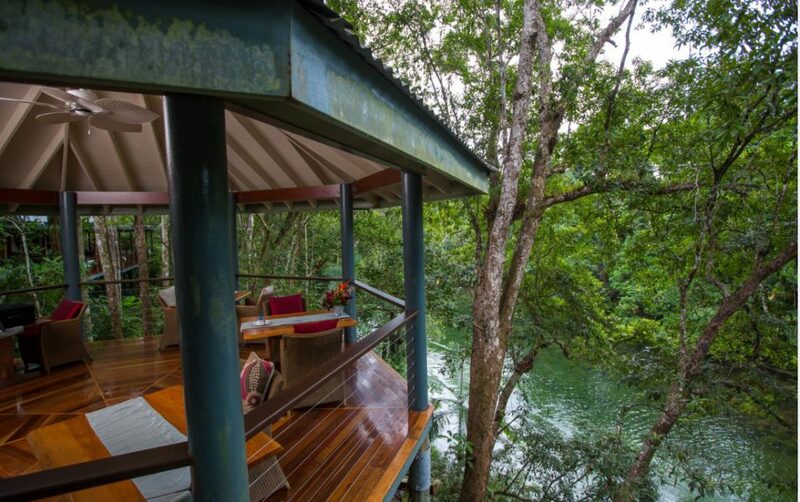 While overlooking the Mossman River, we went over our itinerary for the next two days. We enjoyed our welcome cocktails while our treehouse was being prepared. 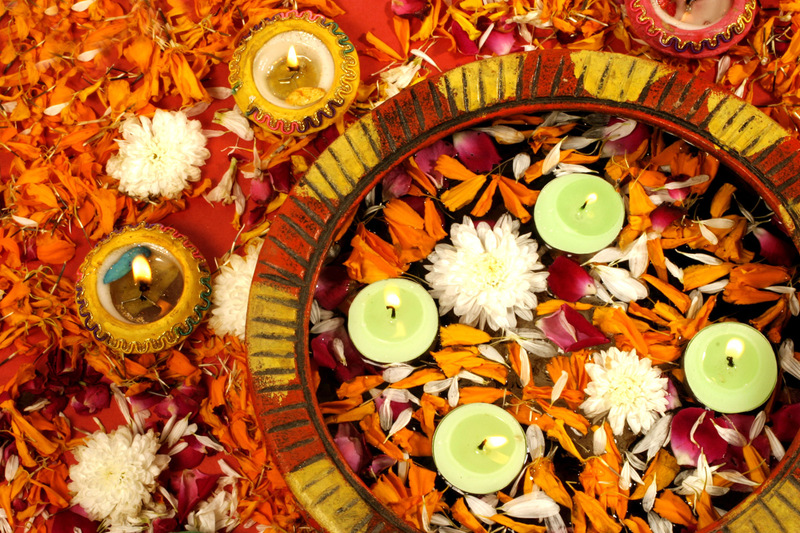 Chilled wine, a handwritten note, lit candles, and soft music greeted us as we walked in, and a sense of peace immediately flooded us. 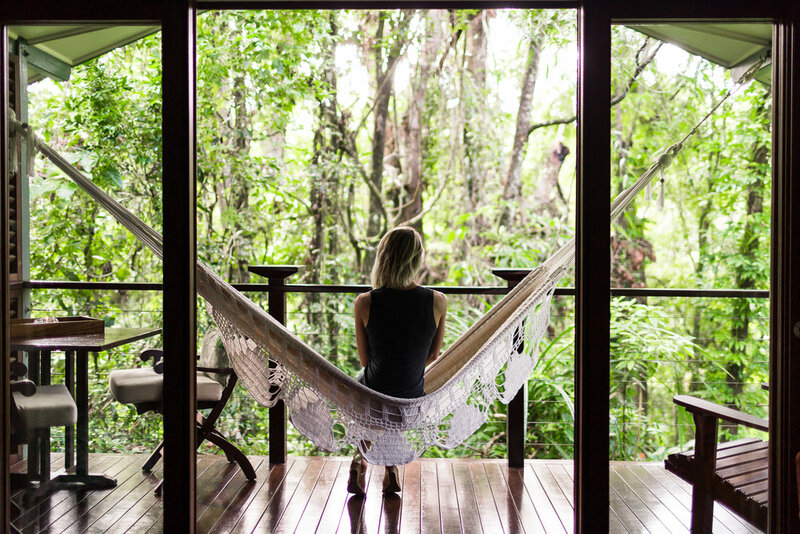 Each treehouse has a large outdoor porch with a hammock, and all the amenities you could wish for. 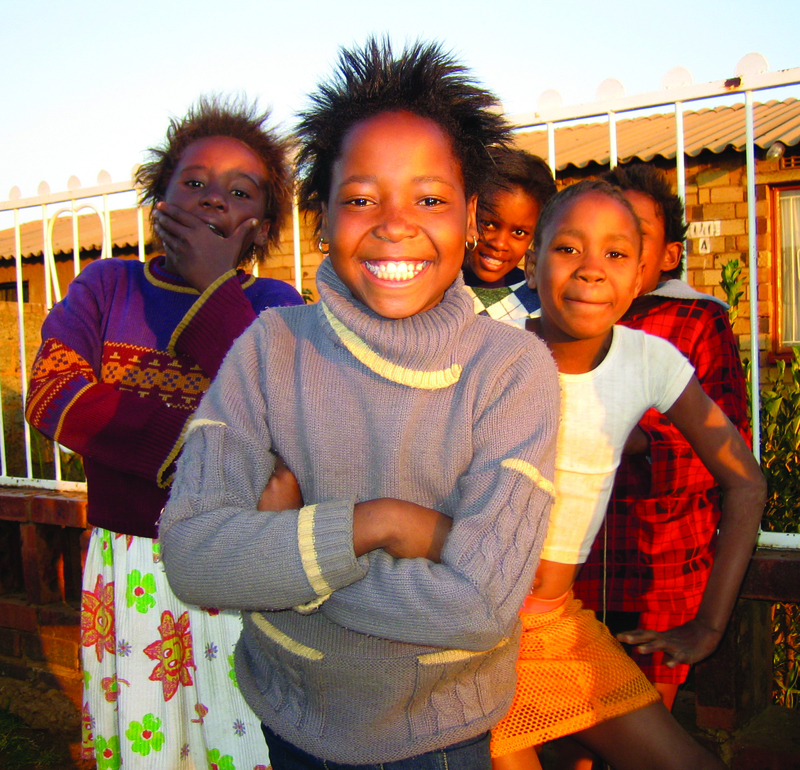 We spent nearly all of our time outside, taking advantage of every recreational activity the lodge had to offer. First, we got a picnic backpack from the kitchens and hiked a gorgeous trail that ended at a huge flat rock with a rope swing into the river. 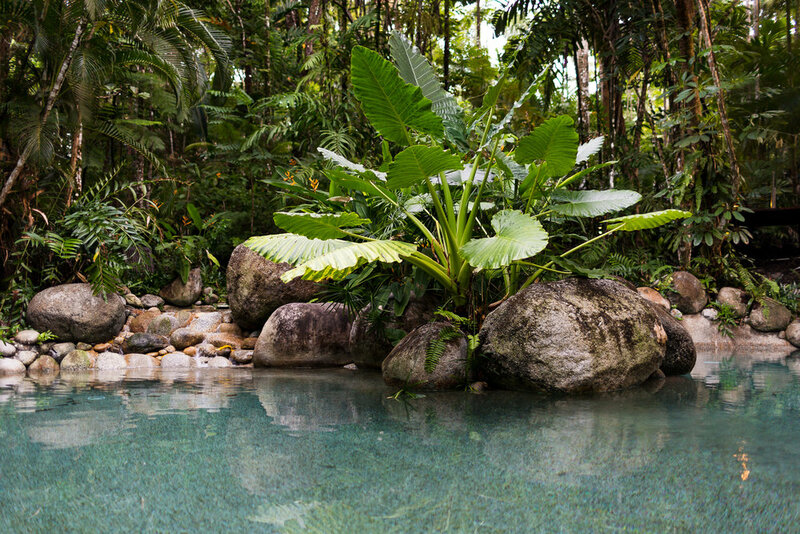 Then we kayaked and swam in the natural-looking outdoor heated stone pool. We also went on a sunset bike ride through the corn fields outside of the rainforest. You name it, Silky Oaks has it. After the end of an active day, we made our way back to the main lodge for dinner. 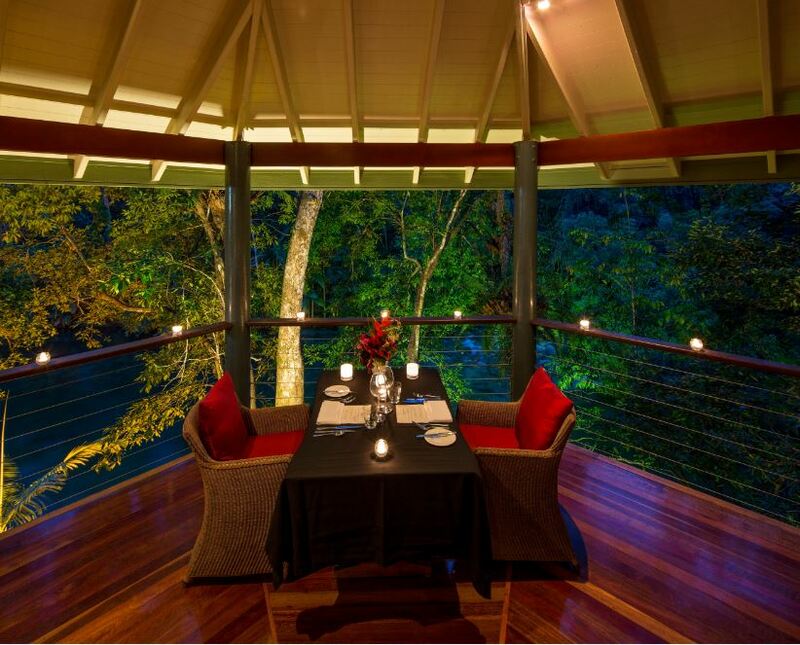 The Treehouse Restaurant – one of Northern Queensland’s premier dining experiences, is a unique open-sided restaurant that features unobstructed rainforest and river views set above the trees. The food was exceptional, focusing on seafood given its close proximity to the ocean. 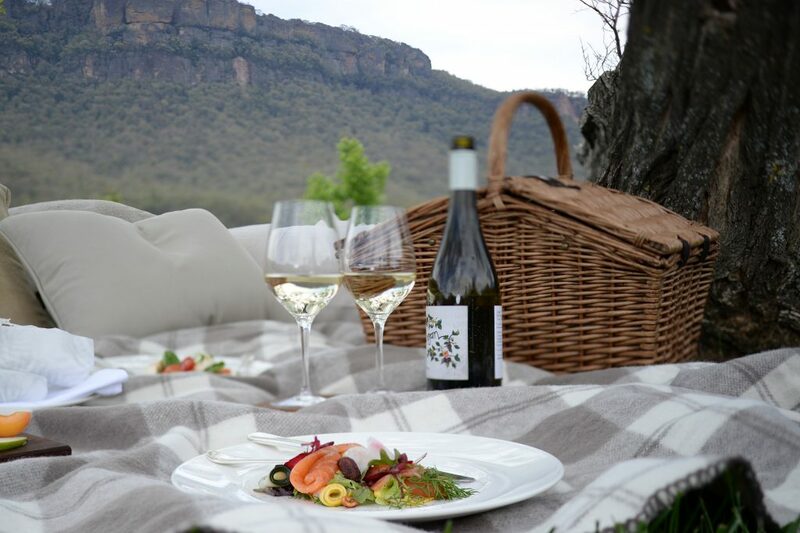 The menu showcases the freshest local produce and Australian wines. 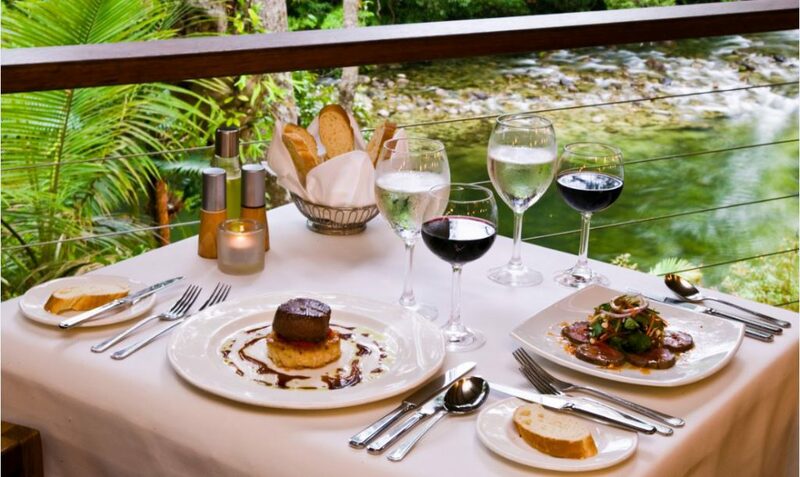 There are a-la-carte options, or you can pre-book your dinner for a two or three course option. I highly recommend booking at least the two course option, as you’ll want to take advantage of the world-class food the lodge has to offer. 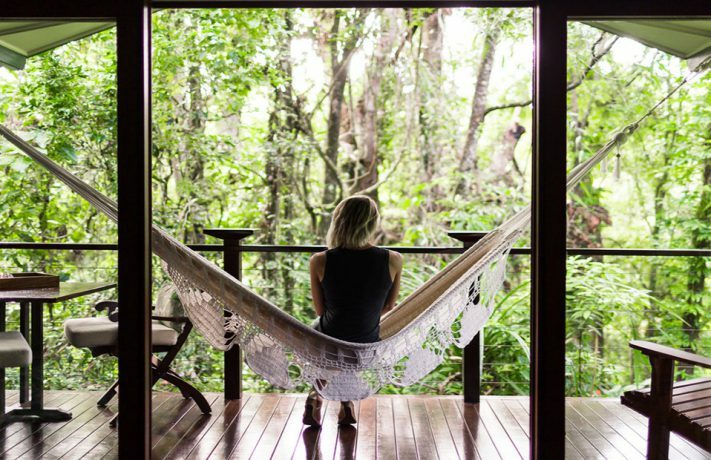 After dinner, it was time to turn-in for the night, falling asleep to the sounds of the rainforest and flowing river.